The 5th Field Artillery Regiment was first constituted 25 January 1907 and was subsequently organized at Fort Leavenworth on 31 May 1907 using new and existing units, including the 2nd Battalion that was stationed in the Philippine Islands at the time. Battery D of the newly organized regiment traced its lineage back to Alexander Hamilton’s New York Provincial Company of Artillery, making it the only Regular Army with roots that dated back to the Revolutionary War. Assigned to the 1st Division, 5th Field Artillery (comprising 1st and 2nd Battalions) took part in an astonishing seven campaigns during World War I. Today, 5th Field Artillery Regiment has just one active battalion: the 1st Battalion is assigned to the 1st Brigade Combat Team, 1st Infantry Division and headquartered at Fort Riley, Kansas. 3rd and 5th Battalions, 5th Field Artillery share the same lineage as the Regiment and were inactivated following Operation Desert Storm. 4th Battalion, originally constituted in 1901, became a part of the Regiment in 1983; it was inactivated as part of an Army-wide drawdown and reorganization in 1996. 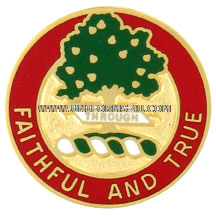 For its Regimental Distinctive Insignia the 5th Field Artillery Regiment looked to its most famed member, Alexander Hamilton, and adopted the design of the Hamilton family crest for its insignia, complete with the motto “Through Faithful and True.” The insignia was first approved for wear on 21 January 1924.